A street party organised by three Middlesex University students as part of their degree coursework celebrates the 70th anniversary of VE Day on Sunday 10 May. Abigail Wileman, Agnieszka Sitek and Daisy Racula have planned the event for Severndroog Castle in London as a piece of first year coursework on the BA Music Business and Arts Management degree they're studying. To fund the event, the trio successfully applied for an arts grant of almost £1,500 from the castle's local authority, the Royal Borough of Greenwich. The all-day party commemorates the end of World War II and features live swing music from the Trinity Laban Conservatoire of Music and Dance, dancing from the London Swing Dance Society, storytelling, craft workshops, face painting and a barbecue. "It's been hectic but we have really enjoyed planning the event together," said Abigail. "We're all friends anyway so working together has been great. "We had a lot of control over the street party and planned a lot of it ourselves – the programme, performers, schedule, everything." Working with Lecturer in Arts Management Dr Zuleika Beaven and Severndroog Heritage Manager Dr Laura Allan, the team were encouraged to apply for grant funding for their client and were delighted to find out their work paid off. As part of the degree students regularly plan events for clients to gain real-world experience of the music and arts industries, but this is the first time that students in their first year have successfully bid for grant funding as part of their coursework. "It was really good when we found we had been awarded the grant, because it meant the street part could go ahead exactly as we planned it," said Abigail. 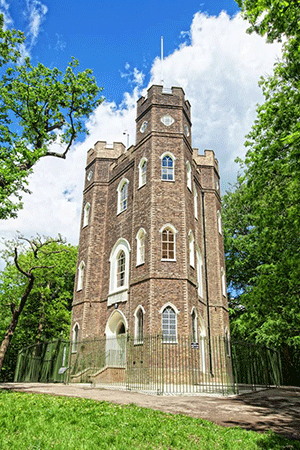 70th Anniversary of VE Day - A Day of Songs, Dance and Celebration takes place at Severndroog Castle on Sunday 10 May from 10.30am until 4pm.